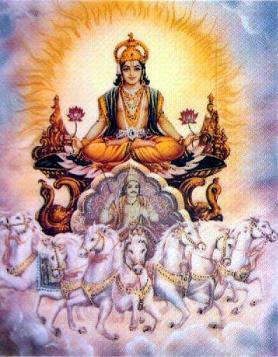 I AM Surya, having come to you through worlds and spaces. Our meeting will not burden you. I will be brief. My brevity will remind you that the period of your stay in space and time is shortened. You should think more often about what you will do with all your illusory hobbies, habits, and attachments when you leave your world. How can you continue your development in the next world if devotion and aspiration do not take the place of the attachments and if love does not take the place of fears? How can you think about perfection if you cannot master the fundamental Laws of the Universe? Your inner world, your harmony with the Divine world, will eventually determine your future and the future of your planet. I come time after time and tirelessly repeat all the same simple truths. Sometimes I have been speaking about the same things for many earthly years, and suddenly a miracle happens. A person experiences illumination with the inner Light and is overwhelmed with this joy of discovery. As a true Teacher of humanity, I step aside so as not to disturb this feeling that a pathfinder unexpectedly experiences. We are happy to observe that there are individuals able to develop, able to evolve. Although the first steps toward the New World are taken with incredible efforts by surmounting huge difficulties, nevertheless, we are happy with that. Even one person who experienced the feeling of contact with the eternal worlds in 10 earthly years is enough for us not to abandon our hope and our efforts to teach and advise the humankind of Earth. Every time when I overcome the huge barriers separating our worlds, I think about how I can do my work in a more perfect way — and in a language that you can understand — to convey information that cannot be expressed in your language because it is too subtle and fine for your rough physical minds. Yet, the more subtle component of space should eventually take its place in your world. It is a pity that not everyone is able to take in the subtle worlds. It is a pity that not everyone can aspire to distant worlds. The Law of space and the physical world is such that you invariably receive exactly the thing that you strive for. You can do anything you like in your world. You are gods in your world. It is for this reason and because of many abuses that were committed by humankind at a certain stage of development that this creative power was reduced. Nevertheless, it still continues working. Yet, to attain the desired results, such qualities as aspiration, constancy, and incredible concentration are necessary. Before this creative power was limited, what used to take a fraction of a second now takes many months or even years. Everything depends on the quality of a person’s heart, on the development of his or her spiritual qualities. But almost everyone who manifests a certain amount of concentration and perseverance is able to reach the goal that he or she strives for in the physical plane. The period of time that passes before the manifestation is necessary in order for you to think over again and again about how much the object or the purpose of your desires correspond to your Divine nature. Therefore, if you really wish to acquire any trinkets of your world, you will find them. If you wish to possess the object of your desires, you will take possession of it. The question is how the things that you strive for correspond to the Divine patterns and the Divine manifestations. By means of the Divine energy flowing through your subtle bodies, you are able to materialize many things with sufficient concentration and aspiration. But will it be necessary for the immortal part of you? Will it be necessary for you to continue your evolution in the distant worlds? Certainly not! Only the quality of aspiration and concentration that you have acquired will remain with you when you continue your evolution in more subtle and supreme worlds. As long as you remain attached to your world, you are attracted to your world again and again, and you have to come into embodiment. Try to give up your world and everything surrounding you. You will not succeed. You cannot give up everything immediately. And you will not be able to live in a world where there is nothing for you in the surrounding physical world. That is why we give you our Teachings with Love, and we guide you in your development. Thousands of beings of Light are trying to keep your world safe so that you do not experience too much stress. However, when the deadlines are approaching, it is time to speed up events. And these times are not far off. I know that 90 percent of the people on the planet will shrug their shoulders when reading the lines of this Message of mine, and most likely they will not understand anything. But I have come for those few who are capable of understanding. I have been talking to you, my beloved. The burden that you are bearing in your world is so heavy. And every year it becomes harder and harder for your bodies to bear the energy loads. Only very strong spirits can bear that and keep the direction. Nevertheless, everyone can stand on the steps of the Hierarchy and ask for help and protection. We do not ignore your requests. Assistance will be rendered, and it will be as powerful as the strength of your aspirations to wake up from your sweet dreams in the illusion. It is time to wake up to the Higher Reality of Being. Wake up! Prepare yourself for the perception of new energies and new vibrations! I AM Surya. With Love I AM. 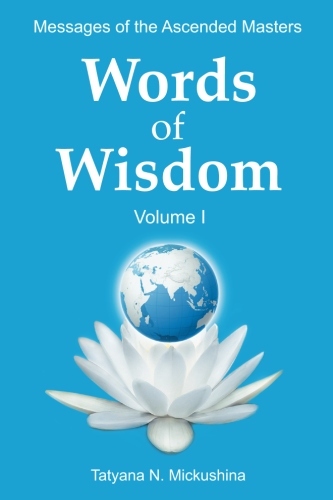 The Teaching of the Ascended Masters in the book "WORDS of WISDOM. Volume 1"
This is the first book in a five-volume series that contains Messages given by the Ascended Masters through their Messenger Tatyana N. Mickushina from 2005 through 2016.